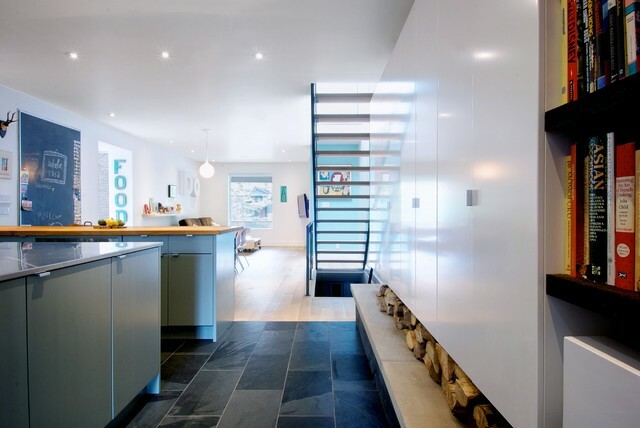 ​One of the greatest things about designing a house is that an idea only becomes outdated if you let it. 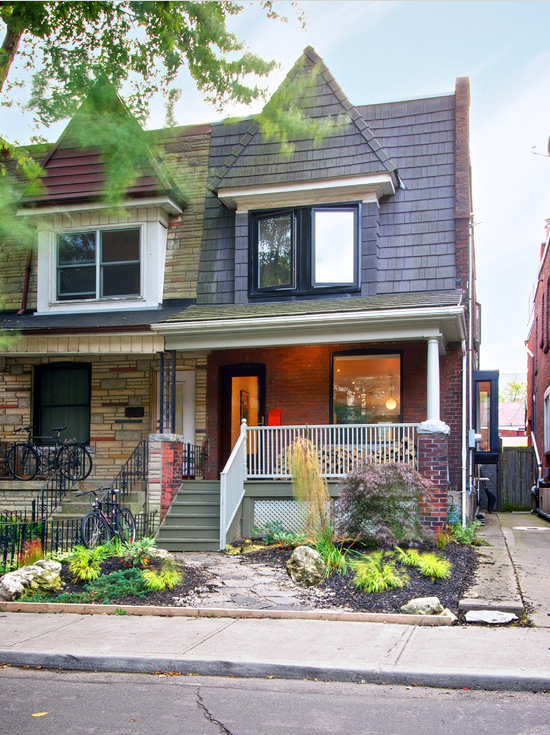 This Toronto house located in Trinity Bellwoods was built in the 1890’s. Instead of changing the original architectural recipe, they spiced it up into something fresh and new. With the assistance of designer Mazen El-Abdallah, house owners Jamie Bennett and Alex Wittholz set to work taking an old space and throwing in some new design tricks. At 1800 square feet, this two floor townhouse is much bigger on the inside than its thin exterior would have you believe. What causes this house to stand out the most is the beautiful spread of colors that paint a fantastic scene for the entrance. The front features a standard red brick design until you get to the middle of the house where grey tiles separate the upper floor of the house which is tiled blue. This a really great contrast to the base, very Dr. Seuss but in a totally good way. The green provided from the small garden at the front and the white from the stair banister also contribute to the unique color pallet. Past the entrance, you can see the homey, calming effect that they went for. The large white cabinets compliment the walls and ceilings and you can see the concrete slabs underneath which hold firewood for the newly installed wood-burning fireplace. This is a good combination of the modern feel of an Ikea unit but doesn't’t sacrifice with the rural concept of indoor wood storage. Also to be mentioned is the lighting in the room, as it features both a hanging, and accent lighting to illuminate every corner of the home. 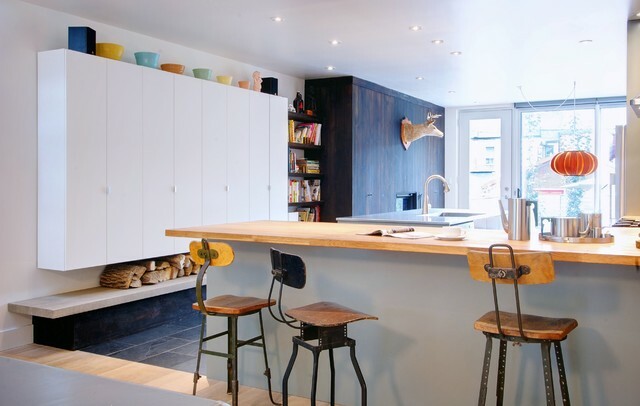 You’re able to see from a different perspective, the black wooden panel wall which faces adjacent to the hanging white cabinets, adding contrast to the mix. Since the cabinet is purely white, you can really see the coloured bowl display which sits on top of them. Again, it becomes easier to see the fusion of rural and modern as the stools used for the kitchen bar table are very retro. Opposite of the den area is a rather large dining room. You can see that rather than using a standard wooden kitchen table, this family chose to include an eight person tanker table. This provides more than enough for the family friends to come over for all those fancy meals. In the center of either wall on both sides features a very large window complete with ledge. This used to be quite popular in older houses, it has the ability to make a large room appear even larger. From the back, you’re able to see some of the more floral benefits of this location. Utilizing the space in the diminutive backyard, this house was designed to have a stone pathway leading through it with greenery on either side. A very great idea for someone living in the city, it never hurts to have a bit of plant life hanging around. Good for the Earth, good for the design. As for the back of the house, an image of a cute little patio pops into view with an open fence on either side for a bit of comfort from the win and privacy from the neighbors. The back of the house uses a similar blue to the roof shown in the front, but instead of tiles it’s made out of wood paneling. 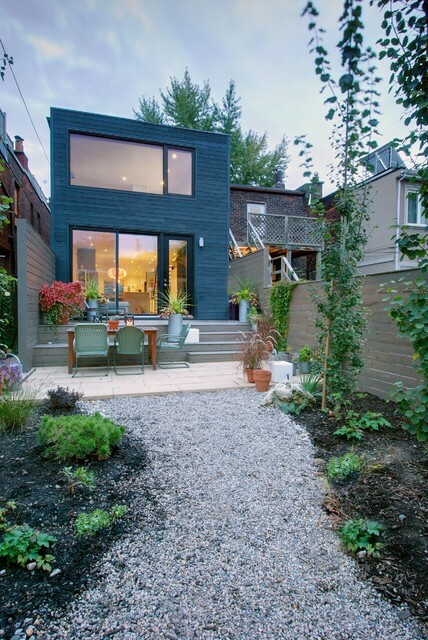 To some this might be a daring approach because the house suddenly stands out amidst others on the block. However, as a personal reason, this uniqueness is exactly why I think it’s a fantastic idea. For those that love the idea of loud colours in their house but don’t know where to begin, this link offers a wide look of the different designs you can create for your own home.